Just after 11 o’clock, Don was heading to the grocery store for April when he bumped into a distressed young man on the run. Only briefly shocked at meeting a giant turtle, the young man had more important things on his mind and hid both himself and Don from a car full of gang thugs that were hunting him. The man introduced himself as Sal Pitela. A local gang, the Daggerlords, had invaded his apartment and taken his wife and children hostage. Sal managed to escape but he feared what might happen to his family if he didn’t get help. He asked Don to meet him outside his apartment on South 5th Avenue at midnight while he tried to get help from the police. Well, it’s midnight and Sal is a no-show. 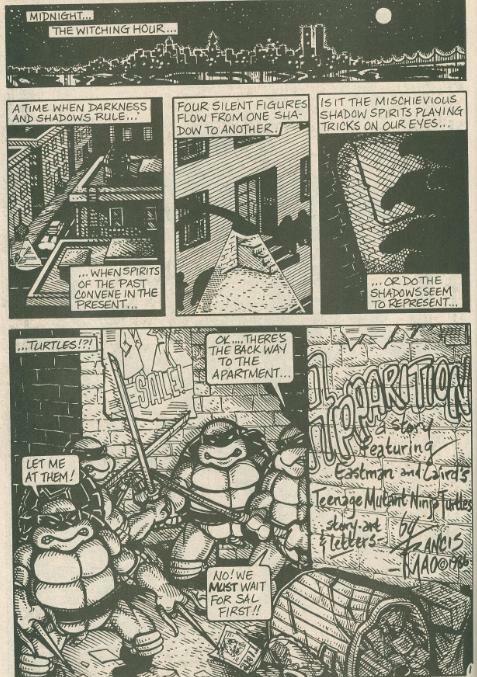 The Turtles begin discussing what to do when they hear a woman’s scream coming from Sal’s place. They decide to intervene, while Don stays behind and waits for Sal. As his brothers invade the apartment and begin knocking gang-banger heads, Don is approached by the shadowy figure of Sal, appearing from a darkened alleyway. Sal tells Don that he didn’t make it to the police and that it’s up to him to save his family. Don joins his brothers and dispatches with all the thugs. 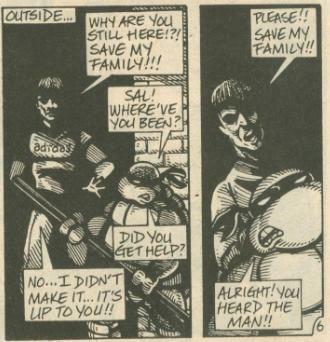 Mrs. Pitela (thinking the Turtles are wearing weird gang costumes) thanks her saviors, though Don reveals that it was Sal, outside, who was the real hero. Mrs. Pitela conveys shocking and tragic news that it couldn’t have been Sal that Don had talked to a moment ago, as the gang had shot him earlier when he was trying to escape and carted his corpse back to their apartment. Don and the Turtles investigate the bedroom and Don IDs the dead body on the bed as Sal Pitela. Three of my favorite stories in the original Turtle Soup one-shot all happen to be horror themed tales (the other two being “Turtle Dreams” and “The Howl”). Turtle Soup wasn’t exactly intended to be a spooky anthology, but such stories make up about half its content never-the-less. 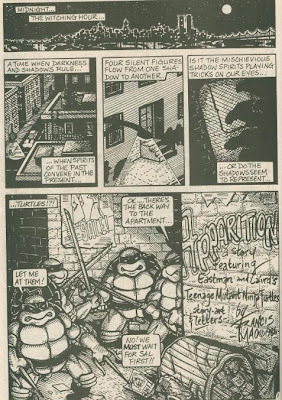 “Apparition” begins as a typical Turtle tale, with one of the ninjas minding his own business and being thrown into an adventure by pure happenstance, this one involving street thugs and a hostage situation. While the twist ending spoofs one of the more well-known ghost story tropes in existence (think of the bit with Large Marge from “Pee Wee’s Big Adventure”), it’s still chillingly effective in its execution. Mao’s artwork is fittingly dark and gritty, with the inking complementing both the urban and ghostly natures of the short. His pencils aren’t entirely to my liking, particularly the expressions on the human characters like Sal and a few mishaps in anatomical size balance (Sal’s itty-bitty baby hand on page 6 distracts from his apparition’s haunting appearance). While “Apparition” probably averages out to a pretty “okay” story, I found it was one of the better installments in the one-shot even if it doesn’t hold up that well to in-depth scrutiny. Probably one of my favorite issues. I just wish the ending was edplained better.